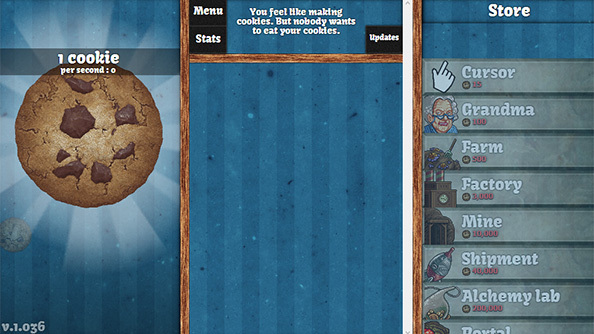 i don’t play a lot of PC games or browser-based games, but i got interested in cookie clicker from a video game web comic i’d come across and liked called the gamer cat. i’m guessing that comic is reasonably well known, but in any case it was only after the third mention or so that i looked it up, and, somewhat surprisingly, the game was actually pretty fun. this review will tell you everything you need to know, but the gist of it is that you click on an icon of a cookie to “bake” a cookie, and pretty much immediately you earn upgrades. the main entertainment of the game comes in the form of unlocking upgrades so i’ll refrain from too many spoilers, but basically the game exploits what is apparently a basic human obsession with seeing numbers increase and unlocking completely meaningless virtual achievements (there’s something irresistibly satisfying about seeing your rate of cookie production increase from 2.916 billion cookies per second to 2.917). it’s pretty fun, although by the time i got to the twist that comes near the “end” of the game i’d lost interest and was ready to retire my baking equipment. the game is extremely polished and has retro-style graphics (although no music), and when combined with a funny premise and ludicrously simplistic mechanics and some entertaining writing it ends up being quite addictive, if not long-lived. an entertaining diversion, and one that will leave you with a craving for cookies and a newfound appreciation of the art of baking cookies, not to mention a new way of looking at grandmas. – you prob. will only really need one link, which is to the wikia for the game. happy clicking! 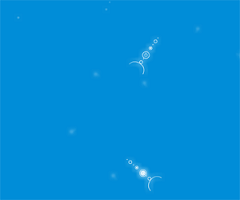 thatgamecompany has gotten loads of acclaim for their 2012 PSN game journey, so i thought i’d see what they hype was all about and start with their first game, flow, originally released online as a USC grad student project in flash. the game is stylish to be sure, and the gameplay is easy to understand: direct a snake-like microscopic organism and eat other creatures to expand your body. the gameplay is simple and a runthrough of the main experience can be completed in less than an hour. i got bored in a fraction of that time, though, and i agree with gamespot’s review of the PSN version which said it lacked “a lasting gameplay experience” and that “the aesthetics clearly take precedence over all else” and that “not everyone is going to have interest in spending money on a game that’s equivalent to an attractive screen saver you can steer”. although i’m all for “artsy” video games, i wasn’t particularly taken with this one, although i liked the concept of ascending and descending layers (like floors of a building) in order to reach the goal. i’m pretty surprised that they stretched the original flash game to a PSN title that pretty much just seems to add tilt controls and new creatures to play as (and of course, a slew of achievements of varying degrees of pointlessness), but even more surprising is that that version has 4.5 stars (user rated) on the PSN page and a price tag of $6. the reviews on metacritic give perhaps a better sense of the range of reactions, but for my part i find myself wishing there was more substance as opposed to just pure style. i actually played the game several months ago, but thought it was too short to devote a whole post to. for completely different reasons i played through the bulk of art style: rotozoa (aka art style: penta tentacles). i’ve been documenting my gradual survey of the series, although up to now i’ve been playing mostly puzzle games on my DSi XL. rotozoa is a wiiware release, and unlike the other games in the series i’ve played is an action/arcade game rather than a puzzle game. from far away the game looks somewhat similar to flow (and i’m def. just one of many who has noted it) in that you’re a little microscopic organism feeding on smaller creatures and growing in size. in the main mode of rotozoa it’s your tentacles that are growing, though, and the game starts with you having to grow two different-colored tentacles to a certain length, with the ability to both move your little organism and rotate clockwise or counter-clockwise. 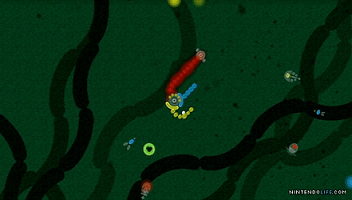 the higher levels increase your tentacles to three, four, and finally five (each a different color), and the behaviors of the creatures you’re feeding on (“goobugs”) get increasingly difficult to manage so that at the highest levels the goobugs intentionally try to hit you from the side opposite to their matching color tentacle. as can be expected from being a part of art style series, the game glows with its clean, cool aesthetic. the visuals are eye-catching although a little on the simple side (although understandable given that it’s a wiiware release), and the music is suitably hypnotic. the game is more like the classic video game snake (which according to wikipedia has roots that go even further back) than flow in that the longer your tentacles get the harder it is to match the right tentacle with the right colored goobug. although the gameplay itself is fairly worthwhile, i didn’t find it to be nearly as addictive as the puzzle games in the series. i was never that big on snake type games anyway, although this game probably beats out the other snake-like game i played recently, the “square” mode of maboshi’s arcade, another wiiware title. the game is easy to get into, but at higher levels starts to fall into the “more frustrating than fun” category, and getting the “all complete” achievement for each level (no damage and no special moves) looks like by all accounts to be a lesson in self-masochism. still, there’s a decent variety of modes, and the gameplay is pretty solid for people looking to tackle a challenge that requires precision and patience. overall this is an example of a game that combines style with substance and doesn’t sacrifice gameplay for aesthetics. this is going to be a quick post. i generally don’t pay much attention to what games have “gone viral”, as most of it is candy crush saga level fare that i have about zero interest in. however, my partner was playing a version where you can substitute your own photos and it looked intriguing. i quickly located the original version featuring numbered tiles instead of pictures, and spent a few hours on it before beating the main goal, which is to create a 2048 tile. 2048‘s creator freely acknowledges the originators of the addictive tile-merging mechanic, namely the game threes which i’d heard about because it’s one of the highest-ranking iOS games on metacritic. 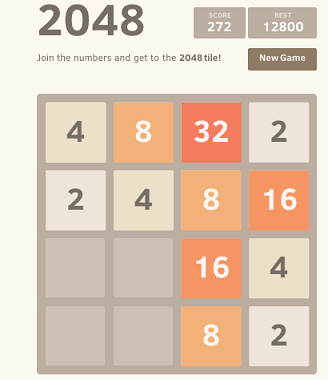 2048 has a nice clean aesthetic, although it’s a one-trick pony: once you come up with a strategy the game can drag on a bit while you try to finish and once you beat it it has zero replay value. but as an afternoon diversion it’s perfectly acceptable and it’s easy to see why it went viral. a couple of days ago wired ran an article delving into the history of threes and showing the blood, sweat, and tears that go on behind the scenes of a hit game and perfectly pitched game mechanic. it looks like the creator of 2048 has avoided making money off of someone else’s idea, but in any case i’ll probably be checking out threes before too long. i seem to be playing a lot of DS games these days. one game that i played a decent amount when i got it and that i picked up again recently was jumble madness for DS. i suppose i looked up the game around the time i was going through my scramble aka boggle phase. i’d always enjoyed the jumble puzzles in the newspaper even though i was never very good at it, so i was looking forward to improving my skeelz. this edition features approximately a year’s worth of regular puzzles, which works as well as you’d expect. there are small but worthwhile advantages in having a DS version of a pen-and-paper puzzle, in particular portability and a hint system. in IGN’s review craig harris says the temptation to cheat is impossible to resist, but i think most people aren’t going to feel the need to try to outwit the game’s basic scoring system and time limit. he also complains about the fact you can’t see the final punchline jumble before finishing the main four, but i didn’t find that to be a significant disadvantage either. 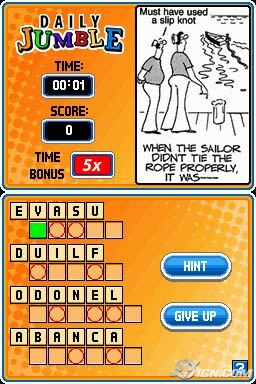 the game offers some additional modes, mostly in the form of jumble crosswords which are much easier and more random than either a regular jumble or a regular crossword, and mahjong-type games which include a pointless “quest” mode where you travel around the globe winning souvenirs (well, at least the music changes unlike the main mode). i don’t really see the point of mahjong-type word games, although actually i suppose it really requires multiple players, but the game does give you extra points if you find the jumbled-up bonus words. i didn’t get to try the game’s multiplayer modes, but i did sit around with some of my siblings and just played against each other in some of the regular puzzles, and that was pretty fun. the production values are, as you’d expect, extremely low, but not offensively so, and the appeal of good, clean jumble fun is high if you’re a fan and need more than just a daily dose. although i just found out that they have daily puzzles on their official site (a flash version, with basically the same interface as the DS version), as well as a few new spin-off games. sweet. another site to add to my list of daily time sinks! 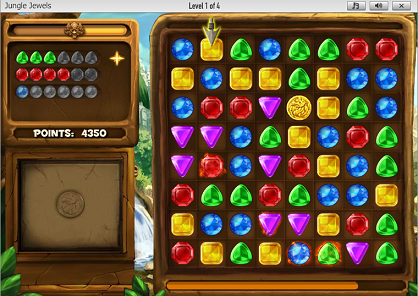 like most people, i’ve come across and played bejeweled online at some time or another. the game never really grabbed me, although its casual appeal is undeniable: according to its official website it’s “the first and only puzzle game since Tetris to be inducted into Computer Gaming World’s Hall of Fame”. but when my bf got obsessive over one of its many unofficial spinoffs, namely jungle jewels on facebook, i found myself oddly hooked. i’m starting to think i’m in danger of getting swept away in all this flood of casual gaming. a friend of a friend was telling me and the bf about how she’s been completely hooked on scramble, so i checked it out, little suspecting that i’d be sucked into it as well. 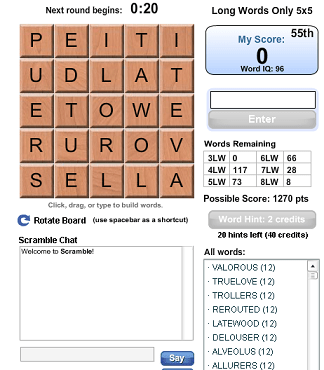 scramble is simply a facebook clone of the parker brothers classic game boggle. i have a dim recollection of my family owning at least a few of the boggle letter dice, gathering dust among a pile of other sorely fragmented board games; but somehow during my fairly normal board-game-playing childhood i can’t remember ever actually encountering a compelete set or playing it. oh, what hours of time wastage i have missed! boggle is a simple game in concept: on a 4×4 grid of letters, simply find as many words as you can by connecting adjacent letters (and not repeating any within one word) within 3 minutes. my family’s always been rather into scrabble, and my sisters had been playing it on facebook for some time. i played a few games, but one of the main things i hate about scrabble is the number of random words that you have to memorize to do well, and so i quickly lost interest. the other thing i hate about it is, as in chess, having to ponder all of your options in order to maximize your points. i just don’t have enough patience to strategize that much (odd, seeing as how i’m into strategy video games, but i guess in the video games you don’t ever have to agonize over any single decision that much). – play virtual matches with 2 to 10 rounds against any of your facebook friends. like online scrabble, your friends can take their turns whenever they want, although you won’t be able to play the next round until at least one person in the match has finished a round you’ve already played. also you can set each round to last from 1 to 10 minutes. – limit the words allowed to 4+ or 5+ letters (the default is 3+). – play on an expanded board: 5×5 instead of the classic 4×4. i find i prefer the 5×5 boards because you’re less likely to get really constraining boards (e.g. ones with 8 vowels on one side and 8 bad consonants on the other). – play live in “rooms” (like chat rooms) against whoever else is in that room (usu. at least 40 other people). there’s a good assortment of rooms, including beginner, intermediate, and expert rooms; rooms using the 5×5 board and/or 4+ words only (those are the rooms i usually frequent); and even rooms for spanish and french word-seekers. – in all the modes you’re given the list of all possible words at the end of the round. – in matches vs friends you can also view a side-by-side comparison of who got what words for each round. – in live mode words that only you got are highlighted in green. there’s also a fair amount of stat tracking scramble maintains, such as your all-time highest score and your ranking compared to your friends. i’d just started getting into scramble when my brother-in-law and sister visited. it turns out that my bro-in-law had completely independently gotten addicted to a version of boggle with his friends on the iphone, called quordy. quordy makes great use of the iphone’s touch screen. it has a “pass and play” feature where two people can take turns on the same phone, and you can also send challenges to people you know who also have the game. it lacks some of the best features of scramble, such as live rooms and a 5×5 board (although i think the latter is being added to the next version), but it does have the distinct advantage of letting you switch to a “lite” dictionary in which only “regular” words are allowed. being able to constrain the dictionary to a normal collegiate dictionary instead of the scrabble dictionary is pretty much the only thing scramble lacks, but although quordy doesn’t have as many features it does make a viable portable alternative (although you’ll also have to factor in the fact that it costs $3 versus scramble which is free). our little group of 5 spent a whole evening with two iphones challenging each other with pass and play games of quordy and teaming up 2 people vs 1, and afterwards when we weren’t all in the same room we turned to scramble to continue the word-making mayhem. i beat my high score in scramble today and at the same time beat most of my friends (i had a really good 5×5 board), although i’m still behind my one friend who became a boggle master after spending a whole summer backpacking around europe and playing it while riding on trains. my fixation has died down, although it looks like i’ll still be playing for a good while, as my family is still sending me scramble challenges. a modern version of a classic game, and pick-up-and-play, episodic, casual gaming at its best. – entry about boggle on wikipedia, although it doesn’t say much about it, not even when it first made its appearance. – there’s a downloadable official version of boggle, although with all the features of scramble (which is free) i can’t imagine anyone wanting to get the official version which is $7. – likewise, there’s a DS compilation that includes monopoly, boggle, yahtzee, and battleship, but from the reviews it sounds like the boggle part of it at least is really lacking in features. it’s an especially unattractive option, given its current price, which at the time of this writing is right around 65 smackeroos. – if i really get in the mood for a word game on the go, i may check out wordjong, a combination of word-making and mahjong, for the DS which caught my attention a while back when it received buckets o’ praise from rawmeat cowboy at gonintendo.com. apparently a wii version of the game, wordjong party, came out this past december, although i don’t remember reading anything about it anywhere and it only has one review on metacritic. but if my family’s still boggling it up by next christmas i may have to pick that one up as well.